Strobe Security Solutions supplies and installs traditional Side Hinged garage doors that combine robust and reliable performance with simple personal access. The main benefits of Side hung doors is the ability to only have to open one side of the door and they do not require any internal roof space. Side hinged doors are firmly framed and fixed at each side with door leafs which swing outwards onto your driveway. We offer the traditional 50/50 split door arrangement or the latest options of a 1/3rd 2/3rd split. 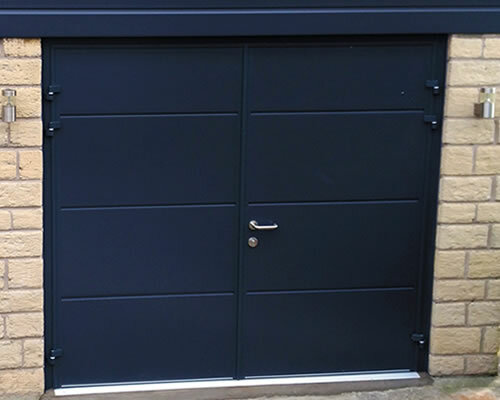 Strobe carries out repairs to a wide range of garage doors including, but not limited to, brands such as: Novoferm, Garador and Hormann. Covering Conwy County and parts of Denbighshire and Gwynedd in North Wales, we have a lot of experience in repair work so you can trust that your door will be in safe hands.